Letting go doesn’t have to be giving up. The primary purpose of letting go is taking hold. It’s not about giving up. It’s about reaching for something better. Don’t give up. Reach for something better. #2. Let go of good to seize great. Peter Gabriel, the first lead singer of the band Genesis, wrote “Solsbury Hill” as a reflection on letting go. He quit the band. In the song, he writes that people would think him nuts. The band was a huge hit. Why close the door on money and fame? Gabriel was the first band member to get married and become a father. He felt trapped by long-term plans of tours that would keep him away from home. He chose family. The toughest thing to let go is something good. A good position. A good salary. A good opportunity. Powerful values tell you what to let go, even when it’s a good thing. #3. Let go current strategies and methods. Change your approach. Keep the same goal. 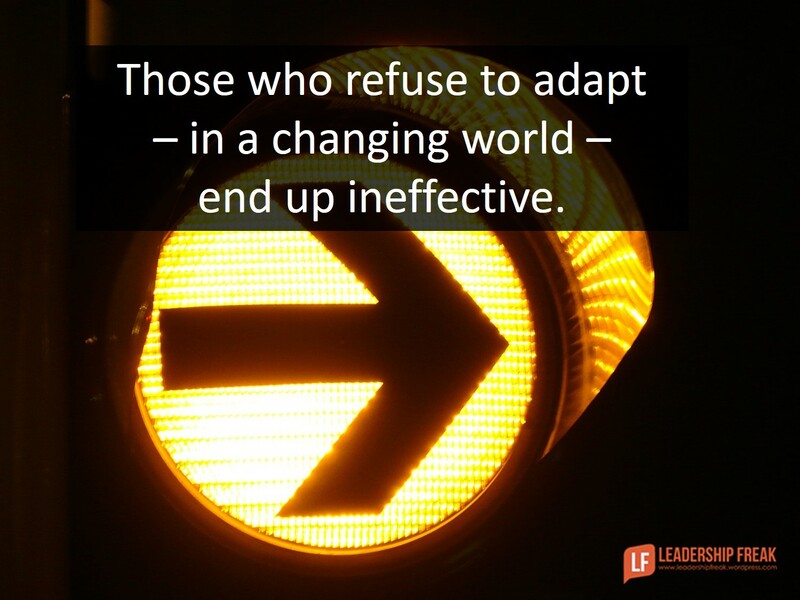 Those who refuse to adapt – in a changing world – end up ineffective. Don’t jettison your values. Evaluate methods brutally. Are you making progress? #4. A compelling “with” enables letting go of good things. The ancient story of Moses says he chose to suffer “with” his people, rather than enjoy the pleasures of Egypt. Your future is shaped by your “with”. A new “with” reflects a new direction. Your “with” makes it worth it. A compelling “with” enables you to let go of good things that hold you back. 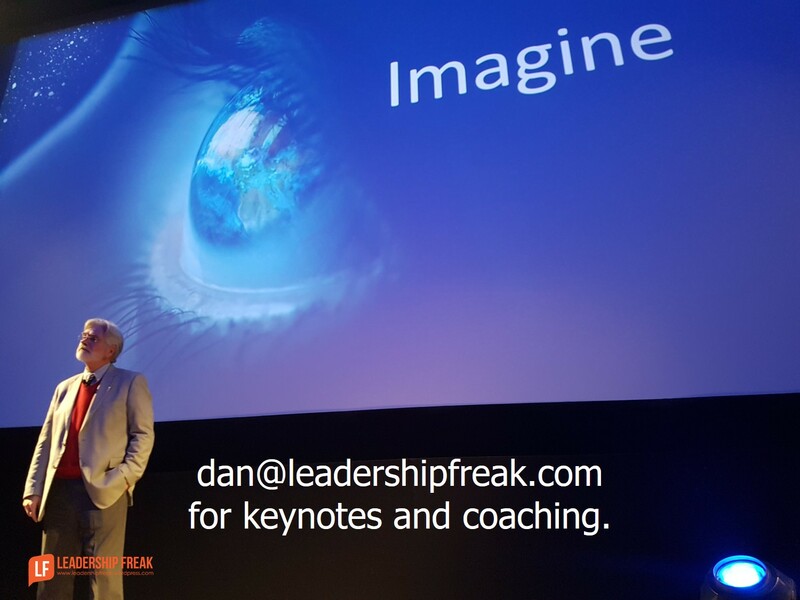 How might leaders let go of what holds them back? Dan, Such a great view today! “Adapt” and you will change, “refuse” and you will flounder into a lessor role! Look around and you will see those who can and did adapt and those who resisted, you can still resist and succeed, the path may be longer Trek with more road blocks. Thanks Tim. One of the toughest decisions is when to adapt vs press forward. There are personal issues. How do we feel about ourselves? There are perception issues. How will others perceive us? There are strategy issues. Will adapting really make things better? Your observation that we may still make it, but the path may be rockier than necessary. Dan great subject. I find I learn a lot and have to let go of some of my traditional approaches from what I learn Mentoring or coaching younger people. In working with an upcoming financial person in a large information technology role I started to explain my normal suggested path to become a Chief Financial Officer- some accounting, some treasury etc. Then after a couple sessions I realized that his current path through Information technology may be the best route in today’s world where everything and everyone uses and needs data. So learning to drop old ways by working with younger people. Thanks Brad. You are so right! Working with people changes us, even as we create an environment where people change themselves. It takes openness and humility to be the learner when you are also the mentor. Great illustration. Thank you for this article. I am a disabled veteran who has been taught you work until you retire. Now because of my physical disabilities, at age 49 it is has come time to change my “with.” My family’s financial future looks bleak, but my doctor says it is time to finally consider my physical limitations (and ignore my mental aspirations of working until retirement.) To borrow a part of your #2, We need to Let go and Let God. It is tough to let go, and it counters everything I have ever learned. Thanks VK. You bring a deep sense of sobriety to these ideas. Sometimes there is distance between the heart and our capabilities. I see a sense of grit and faith in your comment. The grit and faith that have taken you this far will serve you well on your new path. This is the part of adaption I referred too, in my younger years the physical prospect of me for example, “keep climbing poles and you will be in a wheel chair by the time your 50” the Doctor stated. “So I can’t climb poles: I responded, he responded “you can climb just be prepared to suffer the circumstances”. Enter the fear factor, do we risk our future or adapt? Adaption has so many applications you never know which form of adaption you may require, physical, mental or both. Took time eventually I became an office employee! PS Thank you “VK” for your service we salute you sir! A good proposition. But ‘let go’ is not to be confused with laundering with goals and objectives as well as losing consistency in efforts for goal achievements. Dan, this really resonates. I align it with that constant balance that we should be looking to achieve, between ‘focal vision’ & ‘peripheral vision’. Focusing on the vision, direction & goals, but also being continually aware of the peripheral changes in the landscape that exercies the foresight needed to know when to let go and adjust to realise that higher purpose.